I commend you to this excellent film about Barry Flanagan, an artist beneath the radar for most of his life. 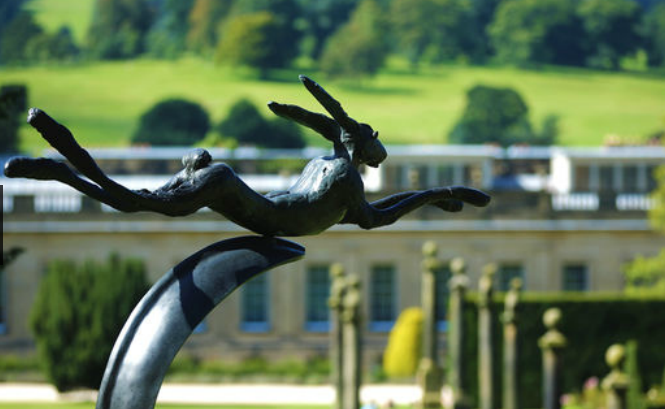 For many years, almost as long as I have been looking at art in fact I had always been perplexed by Barry Flanagan’s work, the hare sculptures in particular. I raved silently to myself – ‘ Barry Flanagan – what’s it all about? What’s it all about? ?’ Maddened by the seeming irrelevance of the hares to…well, anything really. And for a while they also seemed to by multiplying like rabbits. I just didn’t get it. People I met who had met him (two that I remember) seemed to be able to shed little light on the man, his work or the reasons for his success. The work seemed flippant and slightly deranged. Then one day, quite recently, the penny must have dropped and I think I get it now. Or I get something. The seeming lack of connection to the rest of the art world, to the dialogues and debates of modern art is the best thing about it. The hares – it’s all about the hares. They defy abstraction, they are almost cartoon like in their lack of naturalism and their celebration of the hand of the artist in the form, in making it live. In short he was sticking two fingers up at abstract sculpture by sticking a giant bronze bunny on a plinth. But not in an ironic Jeff Koons-type way but in a way that suggested the touch of the artist, that suggested beauty and a certain skill in manipulating materials. Yet they could hardly be called traditional. He steers a fine line between these rocks on which so many other artists founder. The siren calls of irony or of tradition beguile the artist, but give only creative death. Beyond this I think what made these works stick out from the crowd was that they feel alive. That’s what I found disturbing, that’s why they didn’t fit in. To the world of post plinth abstract sculpture, to the high seriousness of art. They were made with a wry twinkle in the eye and a mischievous intent – that alongside ‘serious’ work the difference was alarming, undermining academism. Barry Flanagan you were a true non-conformist, and a true artist. I salute you and you shall be missed. This entry was posted in Art, London, Painting and tagged Art, London, Sculpture.